Julia Piquet presents 5 things you probably didn't know about the LaFerrari. Electric motor produces more electric power than a Toyota Prius. 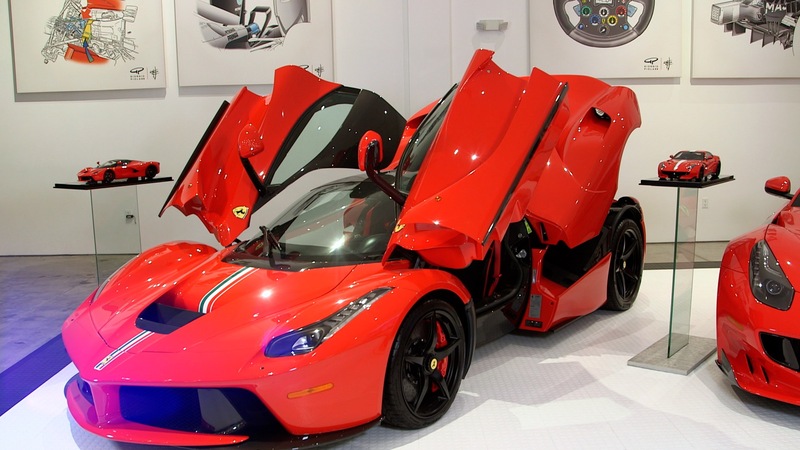 The LaFerrari is the first production car to be introduced by Ferrari with a hybrid drivetrain. The LaFerrari has a 6.3-liter V12, and produces 788 hp, while the electric motor adds another 161 hp for a total of 949 hp. In addition, strong low-speed torque allows for high-rpm rate for the V12 engine, creating a ceaseless surge of power throughout all speeds, and a torque of over 663 lb-ft.
20% lighter than the Enzo. While the LaFerrari may look visually bigger than the enzo, it has practically the same dimensions- and it's lighter! The biggest change is outside the wheelbase, as the LaFerrari's front and rear overhangs are better balanced. When viewed from the front and sides, a sharply downward-sloping nose emphasizes the muscular fenders, perhaps paying homage to the Ferrari sports prototypes during the late 1960s and early 1970s. Can technically drive upside down. The LaFerrari was designed in wind tunnel to achieve perfect balance of aerodynamics and downforce. It uses active aerodynamic systems including spoilers and diffusers that automatically extend or retract depending on speed. Theoretically, if all wings and diffusers remain extended, while also driving over 200 mph, the LaFerrari would create so much down force that it could drive upside down. A new tire set is about $3,000. The front tires are less expensive, but that's probably because the demand is much higher for rear tires. I have a feeling that 1000hp channeled through the back wheels easily burns through rubber. Considering that the tires were specifically developed for this ultra-exclusive hypercar, it is no surprise that the front tires cost $500 or more and the rears are over $800. Track days are not only faster in a LaFerrari, they are much more expensive. Less than 500 examples were built. So it is far more rare than the F40, and it comes in many different colors besides red. This is about as exotic as it gets besides concept cars, 1 off special editions, and seed-capital for unknown brands. That's why some examples have increased in value by 500% since they were sold for $1.7 million. You probably won't own one, most won't drive one, many will never see one, but it is still one of the coolest cars of all time.